The history of Felix the Cat is well documented in John Canemaker's excellent work of reference "Felix, the Twisted Tale of the World's Most Famous Cat" published by Pantheon Books of New York in 1991, ISBN 0-679-40127-X and then Da Capo Press of New York in 1996, ISBN 0-306-80731-9. Similarly, for those interested in Felix's comic book adventures there is David Gerstein's "Nine Lives to Live" published by Fantagraphics Books in 1996, ISBN 1-56097-308-0. These books provide excellent reading and should certainly find a place on the bookshelf of the Felix the Cat fan ! The current volume is complementary to these publications but is concerned only with the original black and white Felix cartoons themselves. 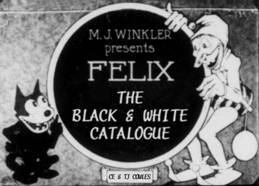 It is intended as a complete illustrated catalogue of these works, a sort of "bible" of information englobing the total output of Felix's black and white animated career, enabling quick and easy identification of Felix prints (especially those which are incomplete or without titles or with unoriginal titles) through detailed synopses and in particular helping to preserve the memory of this marvellous Felix era in one special book. Regrettably, as with many projects of this type, the end result is somewhat unsatisfactory, but then the first edition had to published one day !!!! Film No.1 FELINE FOLLIES (1919) distributed by the FAMOUS PLAYERS - LASKY CORPORATION for the PARAMOUNT MAGAZINE. Release dates are approximate other than for the Educational series. From there on however, the picture is a bit more rosy! The Winkler series contained herein is at least near-complete. It would appear that Pat Sullivan signed three contracts with the distributor for 12 + 24 + 24 films so there should be at least 60 titles in reality. Here there are only 52, but the listing is limited to those films where physical, viewable evidence supported the titles (49 films are described in as much detail as possible) or at the very least a bona fide written synopsis existed (films 20 & 40) or a copy is known to be in existence (film 39 - thank you David for an idea of the content.) Other probable original titles in this series are limited to the general index. For the Educational chapter at least we know that the listing is 100% complete. Sullivan, or perhaps the distributor seem to have taken care to safeguard the exploitation of the character and so all the titles were copyright registered which renders the list easily accessible. Consequently, however, relatively few of these films were released on sub-standard guages for collectors and a good 30% of the films appear to this day to be 'invisible', not even available in any format in the major international film libraries. Do Sullivan's heirs have precious copies decaying in the cellar...........?!?!?! As a result, for uniformity's sake, these synopses are limited to Educational Film Exchanges original publicity statements and illustrations are rather limited (so many films would in any event have been impossible to illustrate...............) This information should be sufficient to identify all the films concerned. We estimate that about 175 black and white Felix cartoons were made from 1919 to 1930 so this catalogue of 139 is not a bad first attempt!!! Details of the film releases by the major suppliers of sub-standard films for collectors - PATHESCOPE and KODAK - are listed in subsequent chapters. This book is dedicated to the memory of Otto Messmer, the animator to whom we must be grateful for giving us so many Felix adventures to enjoy. Search data: Felix the black and white catalogue, Felix the Cat, Pat Sullivan, Otto Messmer, Feline Follies, Felix Saves the Day, fair, makes good, all sea, love, swim, comes back, finds way, fifty fifty, gets revenge, wakes up, minds kid, turns tide, lends hand, gets left, bone age, ghost breaker, wins out, tries treasure, revolts, calms conscience, globe trotter, gets broadcasted, strikes rich, Felix in Hollywood, Felix in Fairyland, laughs last, fills shortage, goat getter, goes hunting, loses out, hyps hippo, crosses crooks, tries rest, out luck, gets can, pinches pole, puts over, baffled banjos, foozled, full fight, goes west, grabs grub, dopes out, finds 'em fickle, finds out, brings home bacon, goes hungry, wins loses, all puzzled, follows swallows, gets fill, Felix Trifles with Time, busts business, trips thru toyland, farm, job, cold rush, eats west, tries trades, rainbow's end, kept walking, spots spook, flirts fate, blunderland, fans flames, laughs, weathers weather, uses head, misses cue, braves briny, tale two kitties, scoots thru Scotland, rings ringer, school daze, seeks solitude, misses Swiss, gym gems, two lip time, scrambled yeggs, shatters sheik, hunts hunter, land o' fancy, busts bubble, reverse English, trumps ace, collars button, zoo logic, dines pines, pedigreedy, icy eyes, stars stripes, sees 'em season, barn yarns, germ mania, sax appeal, eye jinks, roameo romeeow, ducks duty, dough nutty, locomotive, art heart's sake, travel hog, jack all trades, non stop fright, wise guise, Flim Flam Films, switches witches, no fuelin', daze knights, uncle Tom's crabbin', whys otherwhys, hits deck, behind front, smoke scream, draggin' dragon, oily bird, ohm sweet ohm, japanicky, polly tics, Comicalamities, sure locked homes, eskimotive, arabiantics, outlaws, outdoor indore, futuritzy, astronomeows, jungle bungles, last life, false vases, one good turn, forty winks, oceantics, woos whooopee, skulls sculls, April maze, tee time.